ight2Know led a march from John Ross Park to the Johannesburg City Council in Braamfontein to protest against the municipality charging fees for protests. Community and Stakeholder Advisor to the Mayor, Simangaliso Shongwe (speaking through the megaphone) received the memorandum. Photo: Zoë Postman. Right2Know say ‘protest fees’ force people, particularly poor communities, to pay for a constitutional right. Dozens of people marched from John Ross Park to the Johannesburg City Council in Braamfontein on Friday morning, to protest the municipality’s charging of fees to protest. The protest was led by Right2Know (R2K). R2K demanded that the municipality stop charging fees for protests immediately. 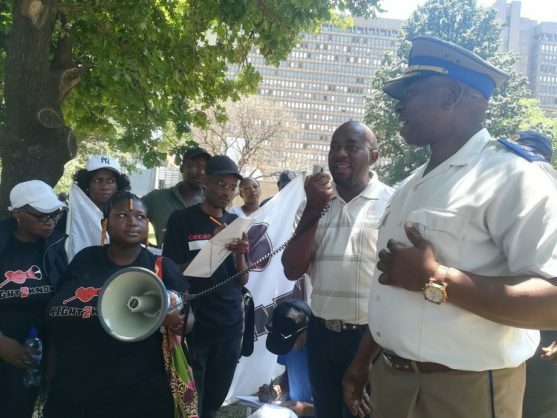 The group demanded the right to give notice of a protest any day of the week, in person, on paper or digitally and that the Johannesburg Metropolitan Police Department stop only accepting notices in person and only approving marches on Wednesdays. Murray Hunter of R2K said the organisation was aware of only two municipalities that charged protest fees. He said this was unconstitutional as it forced people, particularly poor communities, to pay for a constitutional right. “These fees can start at R180 and run into thousands of rands. How can you expect people to pay to exercise a constitutional right? We would not pay a fee to vote in elections and we should not pay a fee to participate in a protest,” read a memorandum handed to the office of Mayor Herman Mashaba. For this march, the Metro Police and the municipality wanted R2K to pay a fee of R446 for “planning costs”. The Regulation of Gatherings Act is the law that regulates protests. The Act states that any person has the right to express their views on any matter freely in public and to enjoy the protection of the state while doing so. The practice of this right, it says, should take place peacefully and with respect for other people’s rights. The Act says people intending to protest must give the municipality seven days notice and provide it with other information like contact details of the organisers, where the protest will take place, what time, and so on. Unless there is good reason to believe that the protest will lead to injury, property destruction or traffic disruption, it should be allowed. If there are any concerns of threats or disruptions, the Act says the municipality and police should call a meeting with the protestors to negotiate a solution. There is no mention of protest fees in the Act. A coalition called Right2Protest (started with the assistance of R2K) has published the first annual State of Protest Report. The report says municipalities often use “bylaws”, which are rules set by local authorities, to stifle protest action. “This matters because the right to assembly, peacefully and unarmed, is protected in section 17 of the Constitution. It is a crucial form of a freedom … [used] predominantly by poor and marginalised communities to make their voices heard and raise grievances on issues that matter to their lives,” read R2K’s submission. Zodwa Madiba is an activist from the Soweto Electricity Crisis Committee (SECC). Soweto falls under the City of Johannesburg municipality. Madiba said the SECC planned a march in Soweto about three years ago. She said the metro police wanted the organisation to pay a fee but the organisation did not have money. As a result, she said that the SECC is on a list of people and organisations that owe money to the municipality. “We believe we shouldn’t pay for a march because it is our right and if it wasn’t for the municipality not delivering services like they promised us, we wouldn’t have to go to the streets in the first place,” said Madiba. The memo was received by Community and Stakeholder Advisor to the Mayor Simangaliso Shongwe and a metro police representative. Shongwe said the municipality would respond within 14 days.